*Edit: This file is part of my Hostess Club files. To see more information about how you can have exclusive access to my CCR library, click HERE. Welcome to week #3 of Artbooking in August! This is a circular hop so if you keep hopping through you'll wind up back here. If you came from Terry's Blog you are on the right track. We have a group of almost 40 CTMH consultants showcasing how the new CTMH Cricut Artbooking cartridge can be used for layouts, cards, home decor/gift items and mini books - so much inspiration its crazy! I have a friend who was just offered a full time job next year teaching first grade. She is such a positive, patient and kind person that I just know all her students and their parents are going to love having her. I made this little box to give her a present for her first week back to full time work. The box is from Artiste but all the elements on top were cut with the new Artbooking cartridge. 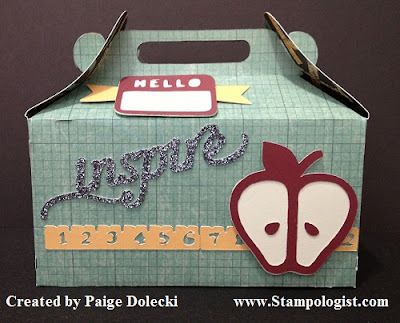 I love the Silver Glitter Paper word "inspire" - I'm sure that is what all teachers aspire to do! This box is about 4" inches tall and 5" wide so it will be perfect for a few chocolates, maybe a small notebook or a bag of cookies. I'll wrap some goodies up and add a jar of homemade Blackberry Jam for a breakfast treat. Oh this is absolutely the cutest present ever! Makes me want to go back to school! What a great way to start off a new year! Lucky teacher!! What a nice gift... it's so cute and sure to bring a smile on the first day of school! Super cute!! Your friend will love it. What a sweet gift! Love how you decorated it! Blackberry jam is the only one we haven't made yet, this summer! We need to get out to the patch before they're gone! Cute gift! My boys start school next week and I've been wondering what to do for the teachers...I think I found some inspiration in your post! 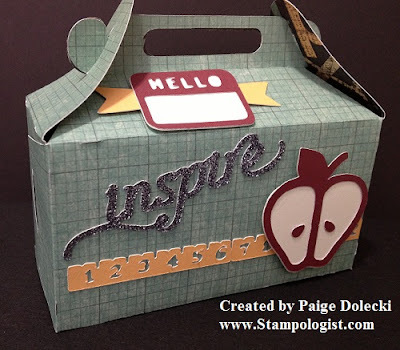 Cute idea for teachers gifts. Great idea Paige! I love that paper pack (I think I've put that on every hop post so far, hahahahah). Love it!